The earliest records of whaling, i.e. active whaling and not the consumption of stranded whales, go back to the Nara-period Man´yôshû (万葉集) which refers to it as isana-tori (いさなとり). Tori comes from toru (取る・捕る) and means “to catch” and isana (いさな・勇魚) is an old word for whale which means literally “brave fish.” But today it is thought that large-scale whaling was not carried out before the 12th century. At that time, whales were mostly caught by driving them into smaller bays which were closed with nets and killing them with hand thrown harpoons or longer lances. The Kujira-ki (鯨記), a work on whaling written in the first year of Meiwa (明和, 1764), says that greater whales were caught by harpooning for the first time in the last decades of the 16th century in Mikawa province by groups of 6 to 8 boats. Apart from that there are records extant that Miyoshi Yoshioki (三好義興, 1542-1563) fixed shôgun Ashikaga Yoshiteru (足利義輝, 1536-1565) a whale dish in his residence in Eiroku four (永禄, 1561). And it is said that the Tosa sengoku-daimyô Chôsokabe Motochika (長宗我部元親, 1539-1599) presented Hideyoshi with a caught whale in Tenshô 19 (天正, 1591). According to records, the organized group whaling system, the kujira-gumi (鯨組), was established by a certain Wada Chûbei Yoritomo (和田忠兵衛頼元, 1555-1628) in the eleventh year of Keichô (慶長, 1606) in Taiji (太地) on the Kii peninsula. Yes, it is the same Taiji which is in the news since some years for its annual dolphine drive hunt. Yoritomo installed whale spotting stations along the shore which launched boats to catch the whales with harpoons and lances. First successes with the new Wada whaling enterprise had Yoritomo´s eldest son Kin´emon Yoriteru (金右衛門頼照), and Yoriteru´s second son Kaku´emon Yoriharu (角右衛門頼治, 1623-1699), who took later the family name Taiji (太地), promoted the increased use of nets. He suggested that instead of harpooning whales in open waters, a lot of smaller boats should drive the whale to shallows where another group of whalers hard prepared nets to hold back the whale and make him tired whilst the others harpoon it. Picture 1: Inshore whaling in Taiji. In the Edo period, whaling was put under direct control of the fiefs, that means the aforementioned kujira-gumi were not bakufu controlled. The whalers held kind a special position as they were paid by their fiefs via an annual salary just like samurai. Incidentally, one whale earned the whalers a profit of about 4 ryô what corresponds to about the annual income of an average lower ranking retainer of one of the fiefs. From Takano Chôei´s (高野長英, 1804-1850) letters to Phillip Franz von Siebold we know that about 300 whales were caught per year. But experts calculate the number of caught whales from Kyôhô (享保, 1716-1736) to the bakumatsu era as about 20.000. 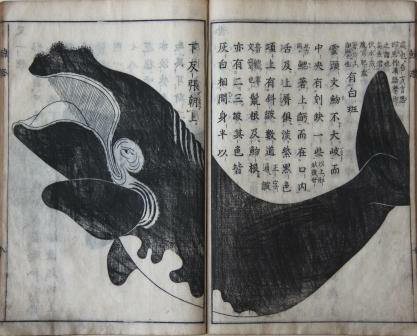 By the way, the Geishi (鯨志), the first book just on whaling published in Hôreki ten (宝暦, 1760) by Katoriya Ji´emon (楫取屋治右衛門), classifies whales as fish. Now to the sword fittings with whale motif. Well, let me say right away that whale motifs are surprisingly scarce although the animal itself is quite majestic and a lot of things were made out of it over so many centuries. Also I haven´t seen or heard of any sword fitting with whale motif from before the Edo period and it seems that the adoption of this animal started rather with wale-related puplications in the mid-Edo period like the aforementioned Geishi. In other words, it was in my opinion more the diffusion of knowledge on whaling that made sword fittings artists think of adapting this motif. Also painters were not so much into whales, apart from the more scientific depictions in relevant publications on fish and animals. Famous for example is Itô Jakuchû´s (伊藤若冲, 1716-1800) whale and elephant screen of which the detail of the whale is shown below. Picture 3: Detail from Itô Jakuchû´s whale and elephant screen, dated 1795. And the most famous whale motif is probably found on a tsuba of Iwamoto Konkan (岩本昆寛). Konkan made much use of empty space, on both sides of the tsuba, which represents on one hand the vast expanse of the ocean and on the other the vast expanse of the sky. The whale has surfaced to breath; the upper part of his large body is visible between the waves. For the whale, a large black shakudô inlay was used. The interpretation of the eye (please note that the whale has almond eyes) gives it a gentle appearance but the silver sawtooth-like teeth are a bit frightening. The sukidashibori and kebori waves are excellently done and give a good feeling of perspective and the cloud bank is truly interpreted in the typical way of Konkan. We have here motion and silence and boldness and elaborate detail combined as is usual for the Konkan school, as if it would be the easiest thing in the world. Konkan was born in the first year of Enkyô (延享, 1744) and died in Kyôwa one (享和, 1801), that means he was 16 years old when the Geishi was published. Please complare Konkan´s interpretation with an early whale painting by an unknown artist. The kozuka shown below is a work of the 14th Gotô generation Keijô (後藤桂乗, 1750-1804) and attributed so by his successor Shinjô (真乗) alias Mitsuyoshi (光美). It is of pure silver and worked in sukidashi-takabori. The whale is of shakudô-zôgan and there are some gold iroe accentuations. Also Keijô´s whale is almond eyed and was truly active at the same time as Konkan. 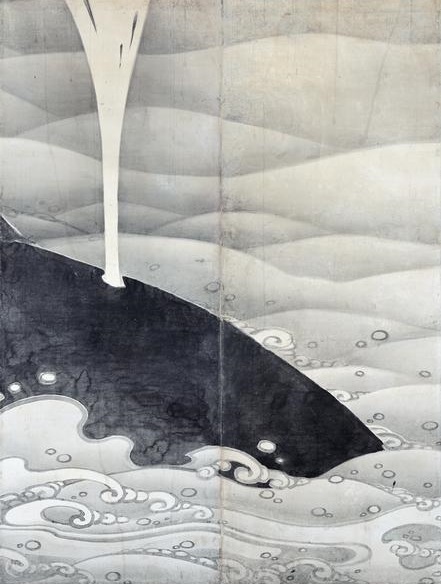 Another whale motif can be found on a futatokoromono of Yoshioka Inaba no Suke Terutsugu (吉岡因幡介照次, 1761-1849) consisting of a wari-kôgai and a kozuka (please click on the small preview picture below to see it a Hajime Zenzai´s highly recommendable blog). Interesting here is that a whaling scenery is depicted as we see a harpooner on the back of the kozuka. The whale os of shakudô and shows a real large almond eye highlighted in gold. And that detail of a whale put to an extreme on a kozuka can be found at another blog entry of Hajime san (please click on the small preview picture below). 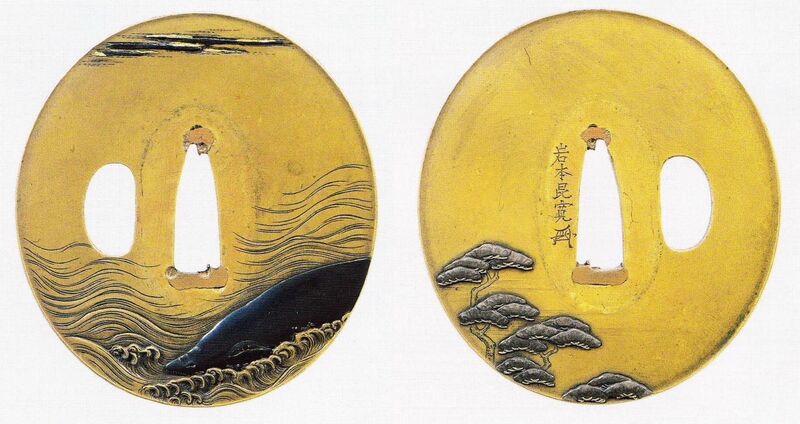 And a tsuba with whale motif can be found here. So all of these are mid to late Edo period works and I would be very pleased if someone could provide me with any pre-Edo sword fitting with whale motif to round off this article. I have been reading your blog on whale depiction in sword fittings. I thought you may be interested in another whale depiction I found recently. I have purchased today a tsuba in relatively moderate condition from a online auction site (so no photos to share yet). It features a turtle and a whale both of similar size engraved on either side of a irregular circle sukashi, so it appears they are pushing a heavy object against each other. On the top half of the tsuba is a depiction of Mount Fuji engraved in layered relief with another sukashi emphasising Mount Fuji’s shape. There are other scenic engravings on both sides. I suspect the tsuba is also mid to late Edo although apparently other tsuba on sale from the same collection from a house clearance appears to be early Edo. The tsuba does have faint kanji. It would be of great interest for me if you share picture of the tsuba after you have received it. So at your convenience, please send any pictures and feedback to “markus.sesko@gmail.com”. Thank you very much for your comment.